DESEAS GENERAR INGRESOS DE MANERA INMEDIATAS CON TÉCNICAS QUE TE PERMITIRÁN PERTENECER A SALAS DE BELLEZAS O PRESTAR SERVICIOS DE MANERA INDEPENDIENTE DESDE LA COMODIDAD DE TU HOGAR. ES HORA DE INICIAR Y GERENCIAR TU PROPIO NEGOCIO!! 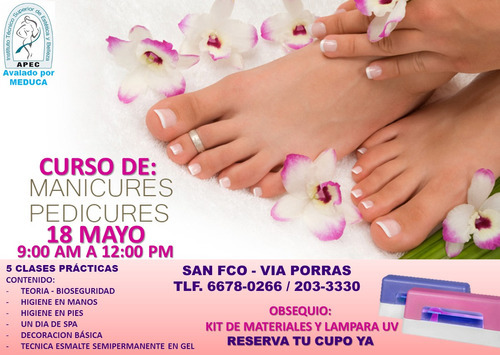 PUES RESERVA TU CUPO AL CURSO DE MANICURE Y PEDICURE CON $65, CON METODOLOGÍA TOTALMENTE PRÁCTICO Y CERTIFICADO VALIDO Y LEGAL.